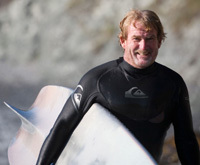 Kevin Naughton has been surfing for over 45 years. He is referred to as a legendary traveler in the surfing world, and his articles have appeared in Surfer, The Surfer’s Journal, The Surfer’s Path, Surfline and Travelers’ Tales books. In 2002, Naughton’s adventures were chronicled in a documentary film, The Far Shore. In 2008, he was featured in the Irish surfing documentary Waveriders. Kevin in Big Sur, Calif. Between world travels Naughton received a Bachelor’s degree in Literature from UC Irvine and a Diploma in Anglo-Irish Literature from Trinity College, Ireland. He currently resides in Laguna Beach, California with his wife and two children. Hi, don’t see an email address on the site. I’d be happy to review the book if you can send me a copy. I will return the copy when finished if needed. Let me know. Thanks. Hi Kevin, I recently saw a review of your book in ‘The Surfers Journal’ and only read the first paragraghs and said i want this book. Like Movie previews if i pick up on something id like to see in the first 10-15seconds of the preview, then I look down…. Yeah I wont watch it. Cos for some reason they always show the action shots that somewhat spoil what could have been a surpirse. So I stoped reading your preview not to spoil what im going to read…. i got the idea in the first few lines, and felt it could be a fun filled goodie. However I was dissapointed not to be able to buy for my kindle via Amazon. Why is that? It would and could be a smart move for you. yes holding a ‘real’ book is great but not always nessasary…. surfers journal is a nessasary cos of all the awesome shots and art. I try to do my part as far as enviroment recyle recycle….